The notarial act must usually be authenticated before it will be recognised and given effect in the state of destination. Authentication may be by way of apostille or legalisation. The Convention of 5 October 1961, Abolishing the Requirement of Legalisation for Foreign Public Documents, known as The Hague Apostille Convention ("the Convention"), provides a relatively simple method, for those states in which the Convention is in force ("States Party"), for the signatures and seals of notaries to be authenticated in the state of origin and recognised, and given effect, in the state of destination. Australia is a State Party to the Convention. In the case of any document to be used in another State Party, authentication is provided by way of "apostille" (a French word pronounced, approximately, "a-pos-teeya"). 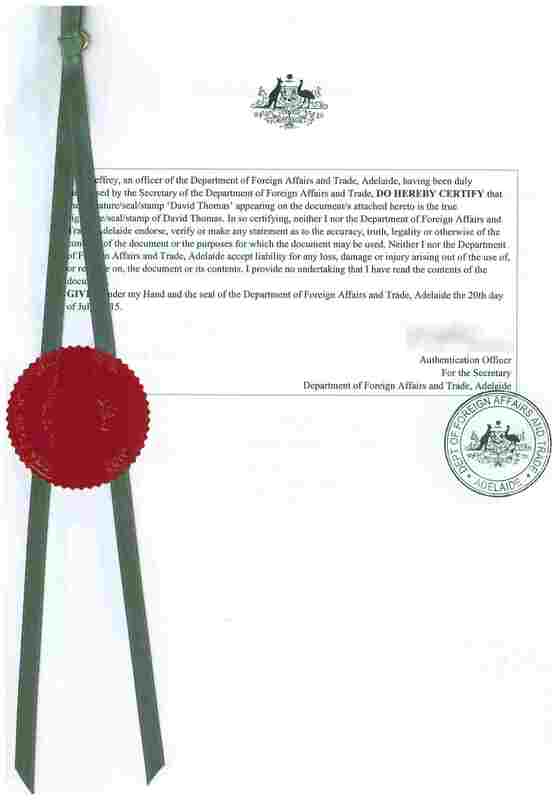 This is a special certificate, provided by the Department of Foreign Affairs and Trade ("DFAT"), for a fee. It is placed directly on the document itself or on a separate attached page (called an "allonge"). This brochure, published by the Hague Conference on Private International Law, provides more information about apostilles. This list of States Party to the Convention is maintained by the Hague Conference on Private International Law. The Adelaide office of DFAT is at 5th Floor, Allianz House, 55 Currie Street, Adelaide. Appointments for apostilles and authentications are mandatory and are available only between 8.30am and 1.00pm on weekdays (excluding public holidays). The telephone number for appointments is 1300 935 260. More information is available at the Smartraveller website. My service can include procuring an apostille on your behalf. 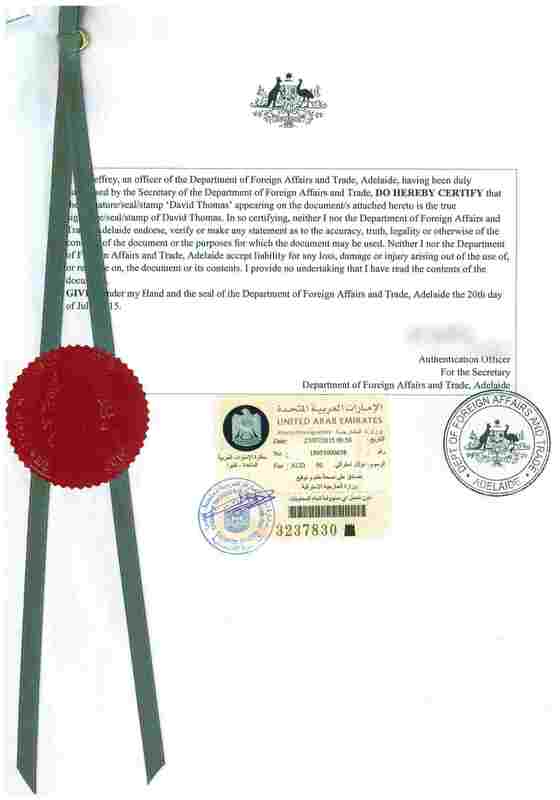 the diplomatic or consular mission of the state of destination then certifies DFAT's authentication. The process can be protracted and expensive, especially if the state of destination has no diplomatic or consular representation in Australia. Lists of foreign high commissions, embassies and consulates in Australia are on the DFAT website. My service can include procuring legalisation on your behalf. 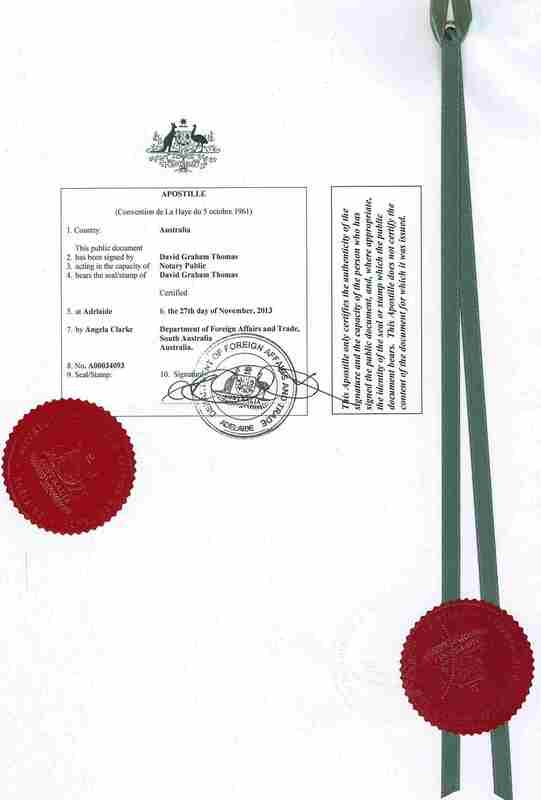 Most states which are members of The Commonwealth, or are British Overseas Territories, do not require any form of authentication of an Australian notary's signature and seal. Notable exceptions are Bangladesh, Cyprus, India, Kenya, Pakistan and South Africa. The various jurisdictions of the United States of America have different requirements, dependant on the nature and purpose of the document concerned. For example, some US states do not require an apostille unless the document relates to real estate or is permitted or required to be registered or recorded in any municipal, county or state office.